One of the most awaited IT events – “BarCamp Yerevan 2017” youth nonconference will be held in Yerevan on May 27-28. For already 9 years BarCamp Yerevan brings together under one roof thousands of IT specialists. The aim of the nonconference is to promote exchange of skills and experiences, as well as establishment of new relations in IT sector. This year as well master classes by the best IT professionals, as well as a job market participated by dozens of IT companies will be held within the frames of BarCamp Yerevan 2017. Event schedule and the list of guests are available on the official website and Facebook page of “BarCamp Yerevan 2017” nonconference. For already 4 years Ucom is the general partner of BarCamp Yerevan. “The development of IT sector is a matter of national security for Armenia and literally of strategic importance to our country. 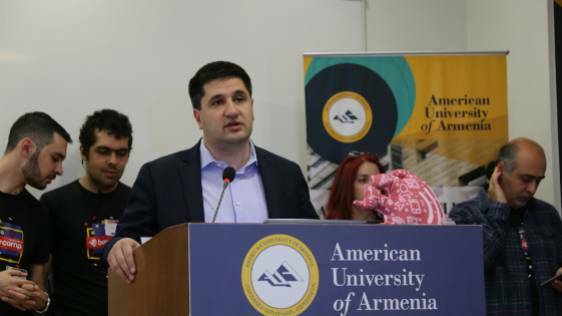 In this respect it’s noteworthy that Ucom supports opening of “Armath” laboratories in 9 regions of Armenia, attended mainly by 6-7 grade students, who try to apply practically their knowledge of algebra, geometry and physics. Besides, Discovery Science and Ucom have announced a contest for young scientists and innovators. The author of the best idea on how the communication will look like in the future will travel to the Netherlands and visit the European Space Agency,” said Hayk Yesayan, Director General at Ucom. Sponsors of the event are Workfront Armenia, SFL LLC and Ginosi Apartels. BarCamp Yerevan can be found on Facebook (www.facebook.com/barcampevn), Twitter (@barcampam), Instagram (https://www.instagram.com/barcamp_yerevan/). The official hashtag of the nonconference is #barcampevn17. BarCamp is an event format allowing to hold open discussions and free exchange of ideas in a nonformal environment. All the events held within the frames of BarCamp Yerevan are fully organized by joint efforts of volunteers, who represent IT technology and media sectors in Armenia. BarCamp has been held in Armenia since 2009. The number of participants of the first BarCamp Yerevan reached 200-300, 8 years later it exceeded 3000.